After an introductory section that addresses the nature of semiotics, the editors discuss themes that highlight issues that have arisen from and that illustrate what has been accomplished in the varied chapters of this monograph. 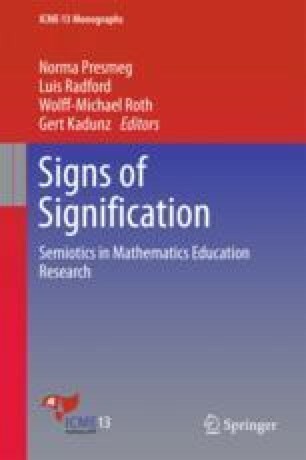 The final section provides some suggestions, based on these issues, for further research on the various threads that pertain to the potential significance of semiotics in mathematics education. The editors believe that there is room for both theoretical development and further empirical studies designed in resonance with these theories, in order to address the full potential of semiotics in areas of research that have not yet received widespread attention. Radford, L. (2015). Early algebraic thinking: Epistemological, semiotic, and developmental issues. In S. Cho (Ed. ), The Proceedings of the 12th International Congress on Mathematical Education (pp. 209–227). Cham, Switzerland: Springer. https://doi.org/10.1007/978-3-319-12688-3_15.